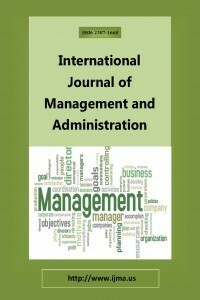 International Journal of Management and Administration (IJMA), is a peer-reviewed, refereed, open access journal that publishes papers on areas of management. The Journal is published three times a year, in February, June, and October. The next issue of the journal will be published on 15 June 2019. ÖRGÜTSEL SİNİZMİN NEDENİ ÖRGÜT KÜLTÜRÜ MÜDÜR?